Facebook has decided that Facebook users would enjoy having auto-play videos automatically play sound as they scroll through their feed. Of course not everyone likes to be auto-blasted with audio and sound from auto-play videos, so some Facebook users may wish to stop auto-playing sound with videos shown in their feed. If you want to turn off auto-play video completely you can do that to a limited capacity in the same Videos & Sounds settings by choosing “Autoplay” and picking the least annoying option available to you on new Facebook versions, older versions can use the approach described here instead. While you’re digging around in Facebook settings, you might also want to turn off Facebook sound effects and Facebook sounds in iOS too. I have a better solution. Stop using Facebook. It’s total crap that poisons the mind with fake news and confirmation bias. Plus it’s tracking your every move and profiling you. I think this setting has changed or is different in Canada. Not the same at all. Options are to autoplay on cell data and wifi; only on wifi or not at all. I agree. It may be different between iPad and iPhone. Examples in the article are from iPhone. On my iPad there is no such option. The instructions are wrong for my version of Facebook. The Sounds control is under a separate tab. Thanks for the tip. I hate it when I’m sleeping and my hub. is on FB and I get blasted awake or vice versa! I have the latest version on IOS, and the option as you show it is not there. The entire “Sound Settings” section is missing. 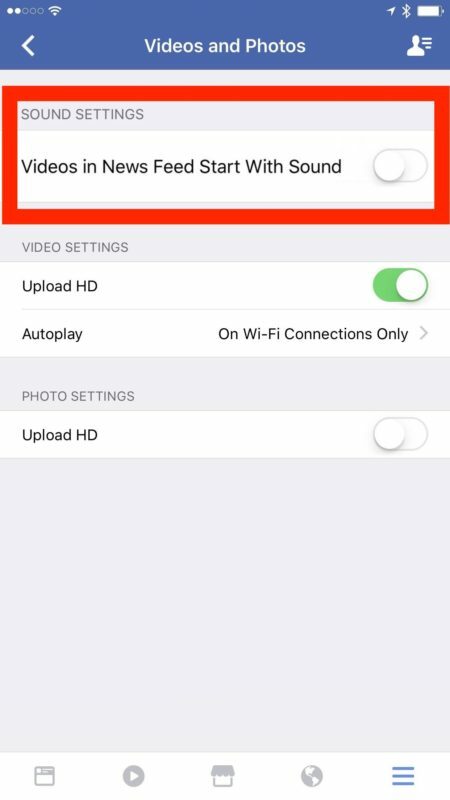 The location shows settings about autoplay videos… iPhone 6 plus and 7.